The bow tie isn’t the sole thing that is making the outfit look formal. Actually, the jacket is doing most of the work. Wearing a bow tie with just a button up shirt and a pair of slacks will instantly make it look less formal. You can even pair it with some jeans or cropped pants. Cotton and Linen are the materials you should consider for a downright casual look you are aiming for. An easy way to make any outfit look more casual is to add some fun prints. To avoid looking comical, you will want to choose ties that are not too big, but an item like a striped bow tie, will make you look more casual instantly. There are a lot more patterns to try out! However, beware of print clashing! If you are going with a printed tie, stick to a solid color for your shirt and pants. There is nothing more formal than a black bow tie, but if you wear a brightly colored shirt underneath, the effect of the shirt will be enough to offset the formality of the bow tie and make the outfit look casual. Of course, be careful with color, or you might look like you just came from a neon party. “Everything in moderation” is a good thing to stick to when it comes to color, so consult the mirror whenever you are mixing and matching, and if you are unsure if two colors go together – they probably don’t! But we got your back as we have an wide range of color selection. Having the right size and shape of bow tie will make all the difference in the way your look comes together. Butterfly Bow Ties screams formal, so you will want to stay clear of those if you want a casual look. Tiered Pointed Bow Ties can have the same problem, especially if it is a more formal print. Safe choice are Batwing Bow Ties , since it gives off the classic look, without being too overpoweringly formal. 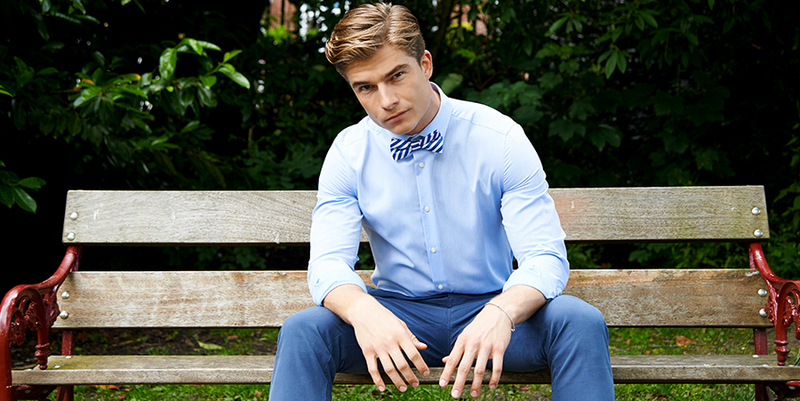 The easiest way to tone down any bowtie is to simply – untie it! This is especially good if you are heading from a formal to an informal event, without time for a wardrobe change. Any tie can look good untied, but there is a special charm to Thistle Bow Ties because of their iconic shaped ends. Whenever you have your bow tie unties, make sure you also take your jacket off, since the two don’t mix well together. And there they are! All the tricks you need to pull off a casual bow tie look. Whether you are a regular bow tie wearer, or only put it on for special occasions, there few styles are always good to have in your arsenal! This entry was posted in Other, Products and tagged bow ties, casual, men's fashion, men's style, menswear.